I look through this photo album and I cringed. There are so many unnamed children and adults. Did they survive? How are they related? Who are you? Who ARE you? 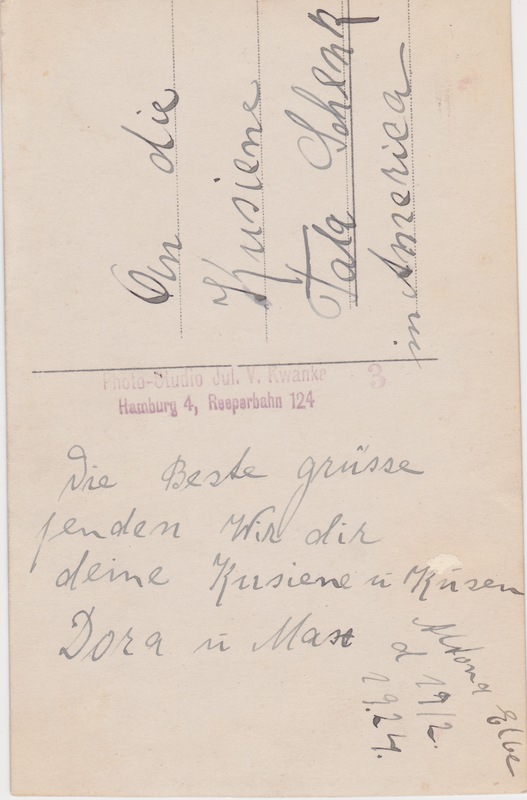 For some I am fortunate, there are names written on the back of the photos in English, or German or Yiddish. And someone can translate the names for me. The English ones are easy, I usually know who they are and how they are related. Some are photos of people I knew about, but had not seen. Some I post on Tracing the Tribe Facebook group to see if someone can translate the words written on the backs for me. Others are photos of people now identified as a cousin. But I have no idea who they are? How they are related? Or what happened to them during or perhaps after the Shoah? The photos are from the 1920s and 1930s in Europe. It is almost painful to look at these photos because I do not know what happened. And I imagine the worst. I only can look at a few photos at a time. 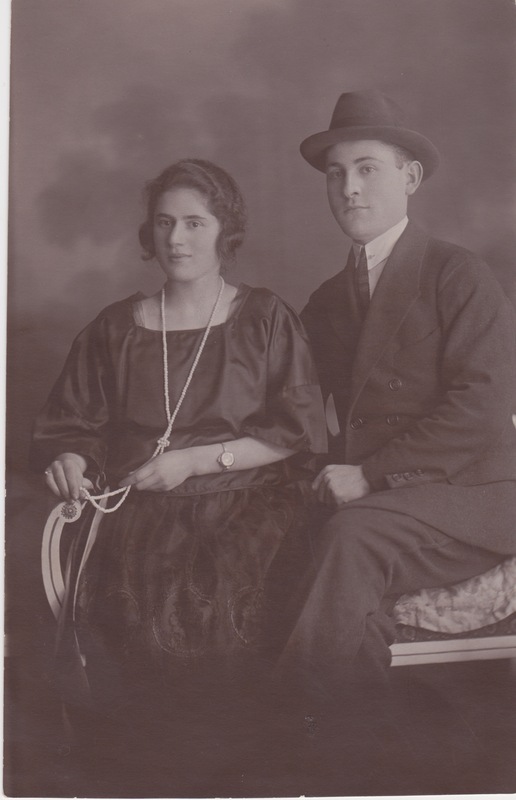 My grandmother’s first cousin, Dora, and her husband. The ones I know give me a chill. I see one of a couple, Dora and Max, from what I think is their wedding in 1924. Oh My. I met Dora in Israel in 1975 when I took my Grandma Thelma to Israel to see her brother and family. She had not seen her brother since 1932, over 40 years. Much had happened to them and to their family. While in Israel on this trip, I met many family members who came specifically to see my grandmother. Although I had lived in Israel and gone to college there for a year, I had not met these people before. And so I answered the questions. The answers were right. My grandmother and Dora were first cousins. They had not seen each other also in over 40 years. They spoke only in Yiddish. I will never forget their meeting. I will never forget the tears and the pain as Dora told my grandmother what had happened. I will never forget seeing them sit together on the couch in our room holding hands and crying. Dora’s daughter, who was the age of my mother, handing them tissues. I was overwhelmed. I was just 20, and this was beyond my abilities to cope. I sat and I listened and I watched. The back of the photo with the inscription. Taba Schenk, Tova Szenk, my grandmother’s maiden name. My grandparents married a few months later, and my grandmother became Tova/Thelma Amsterdam. In the photo, Dora is a young woman, but she looks just like the woman I met so many years ago in a hotel in Tel Aviv. She is not as old of course. But the face is the same. She is cleared eyed holding on to a long strand of pearls, her husband sitting next to her. Dora’s life changed with the war. But she survived. She had children and grandchildren. And eventually reunited for a visit with her kusiene Tova. ← My Premonition Came True: It is a Royals – Mets World Series! What an experience that must have been for you. What did your grandmother say afterwards? It must have been so hard for her to go back home. And for her cousin to see her leave. I write about this trip also in Speaking Yiddish always gives me holocaust memories. My grandmother was very shaken after this trip. It was a very intense month!